Award winning Craigie favourite Jim Malcolm is joined by his award-winning wife! For the past 30 years and more, Jim Malcolm has been a Scots troubadour, taking the traditional songs of Scotland and his own prizewinning compositions to all corners of the UK, and around almost every state in the USA. His voice is one of the finest in Scotland, accompanied by meticulous guitar playing and mouth organ. This year he has another trick up his sleeve! With their children off to pastures new, wife Susie, an award-winning traditional singer herself, has broken out of the Malcolm office. She sings songs from the North East and has a penchant for ballads. Together they offer harmonies and humour, tales from the road, the riverside and from the home front, and are not to be missed. 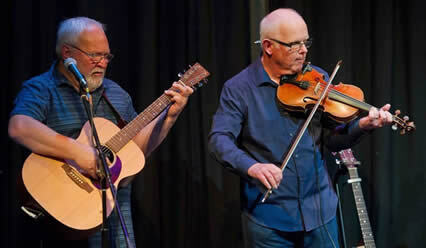 Multi-instrumentalist John Graham and guitarist Jim Jack perform a variety of songs both Scottish traditional and contemporary. Their act evokes much of the spirit of folk clubs in the past, with an emphasis on songs with easy choruses for audience participation. Glasgow based John co-founded the Clydesiders in 1968, a very popular group that performed until 2000. They played regularly on television and radio, on STVs ‘Thingummyjig’ and ‘Shindig’, ‘Highway with Harry Secombe’ and the ‘Terry Wogan Show’ and made ten albums. In the 1980’s the group played annually in the stage show ‘The Pride of the Clyde ’at the Kings Theatre in Glasgow. John plays fiddle, guitar, mandolin and bouzouki, with vocals. Jim plays guitar with vocals and was a member of various folk bands in Glasgow and Edinburgh in the 1960s and 1970’s, making two albums. In the 1980’s and 1990’s he played in different rock bands, before returning to his folk routes. John and Jim have performed together for the last ten years and have recently released their first album.